I love finding new artists in my Google and Etsy searches. And it's especially gratifying when they are from the South. 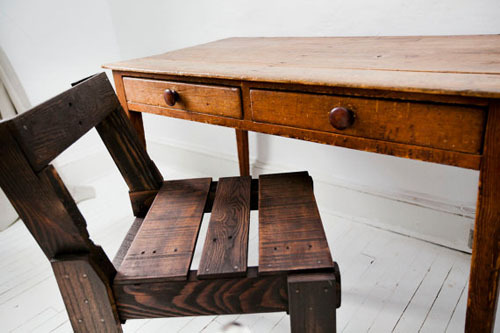 Clarke Titus resides in Atlanta and makes all manner of incredible pieces from wood, metal and found objects. Clark sources most of his materials from Atlanta, Nashville, Charleston and all places in between. He describes his style as "an even mix of rustic, modern and industrial, just like any good Southern city," and savors the challenge of wanting a certain item and then figuring out a way to make it on his own. The objects he finds along the way offer endless inspiration. Like this well bucket Clarke found on a farm west of Atlanta. 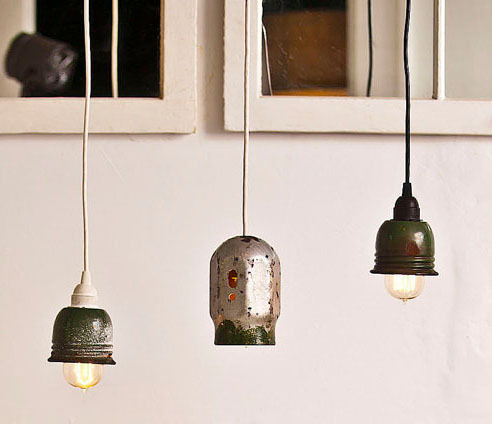 He gave it new life as a charming and functional pendant light. I love old shipping pallets and you see a ton around- either being tossed out or just piled behind buildings. But sometimes, when placed in the right hands, these pallets are transformed into something a bit more stylish, like this Captain's Chair. This chair is made with oak and poplar planks and certainly has a rustic, manly feel to it. I also love Clarke's black wire pendant, found here. Here's another twist on his pallet chair, which has the added benefit of extra storage space. Clarke is always exploring new ideas. As he explains, "I have a hard time making the same thing over and over again without tweaking it here and there or changing a color or finish. I am always looking for ways to make something better." This pendant Clarke calls the One Knot Light, because, as he explains, "when you have a long length of rope, you are supposed to tie a knot in it at 50' intervals." This light actually has 50' of rope and would look great in so many types of decor. I love wood and metal together but now I realize how much I like metal and rope together. See all of Clarke's goods at his Etsy shop...or, if you live in Atlanta, you can view some of his pieces in person at Indie-pendent, a fabulous new store that I'll be blogging about very soon. Thank you Clarke.